A Monthly 3 Years Cash flow Statement Spreadsheet, is an easy to use and easy to understand Software. Calculates everything you need to know and allows you to keep track of where your money is going monthly and yearly. Basically puts you in control of how to manage your cash flows. Forecast Budget for each Month and Year ! Actual and or Estimated Amounts for each Month ! Automatically Calculates Full Year Data ! 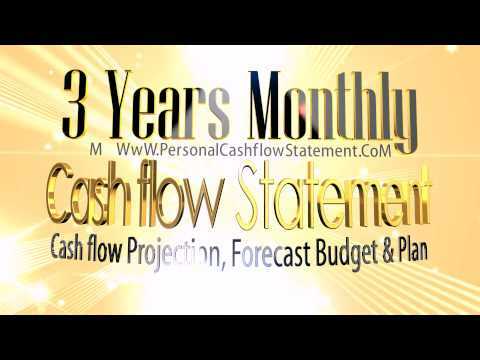 Cash flow Statement, Forecast Budget & Plan. The abilities of this Cash flow Statement. The 3 main sheets:Budget, Input sheet and Full year Data. Professionally Disigned for Personal and for Small to Medium-sized Business Use ! This category consists of up to 9 sources of income or revenue descriptions. This category consists of up to 20 Outflows subcategories and each subcategory consists of up to 9 detail expenditure, namely 180 expenses within 20 categories. The difference between the cash receipts and the cash disbursements for each month and year. Inflows minus Outflows, give us the Net Cash Flow. Opening Bank/Cash Balance plus Net Cash flow, gives us the Bank Balance at the end of a specific period. You have the option to enter an estimated forecast cash flow budget for each month for each of the 3 years period. In this sheet you can enter your actual and estimated amounts for each month. This sheet is automatically calculated. It is linked with the information from the Actual/Estimate sheet along with the Budget sheet. It gives you a full view for the entire year. You will be able to see your projected bank balance at the end of each period, month or year. Monthly and Annual Graphs and Charts showing your bank/cash balance and movement along with a Pareto graph showing the 5 Largest Outflows Categories for each year. Monthly, Year-to-date and Annual Comparative Results Analysis with monthly comparisons for any month during the three years period. 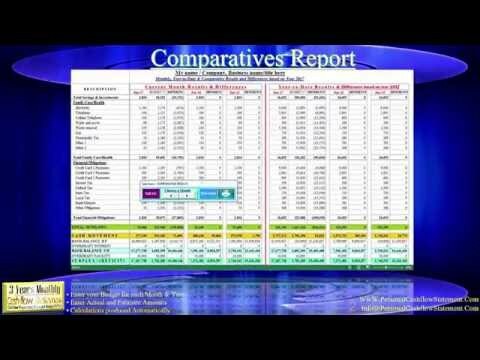 Daily, Monthly and Annual comparative statistics for each expense. All worksheets are Automatically Linked Together so figures only need to be entered once!! You do not need to be an accountant to know your financial position concerning your monthly inflows, outflows or expenses. This easy to use and easy to understand the 3 years monthly Cash flow Statement spreadsheet, calculates everything you need to know and allows you to keep track of where your money is going monthly and yearly. Tracks your cash flow monthly and forecasts your financial position within these three years period. THIS SOFTWARE IS DESIGNED TO MUCH WHAT IS IN YOUR BANK ACCOUNT. Basically puts us in control of how to manage your cash flow. This unique three years monthly Cash flow Statement template, enables users to record their Actual, Budgeted and Projected revenues and expenses on a monthly and annual basis. 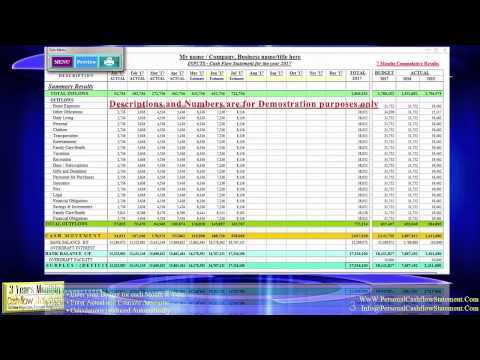 The template produces and compares actual, budget and forecast for full year amounts. The annual cash flow projections are calculated automatically based on the actual amounts, the projected amounts and the budget amounts. This template enables users to create a monthly cash flow forecast for any three year period and to compare the cash flow forecast to actual account balances. The monthly and annual reporting periods are all based on a single user defined start date (as per the 2nd screenshot at the left). 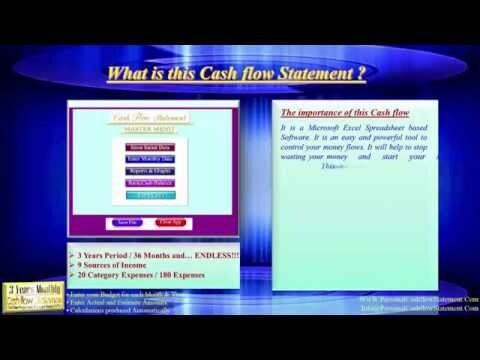 Actual Cash flow statement need to be entered and a unique, Innovative Management Comparatives Report can then be used to compare the budgeted, the forecasted and actual account balances on a monthly, quarterly, semi-annual, year-to-date basis or for any given month and year. The report includes the cash flow statement for all of the cash flow forecast, the budgeted cash flow and the actual results and can be updated by simply selecting a month from the list box from the user-form. This template enables users to automatically compile a complete cash flow statement by simply entering basic Revenues and expenses amounts. The template incorporates a current and comparative financial period and produces a cash flow statement. At work, monthly data is tracked, calculated, and then the results sheets need to be stored somewhere else so the data is not overwritten. Instead of saving the entire master workbook with all kinds of un-necessary extra sheets, and calculations that could still update, this feature will copies each year data (Budget, Actual/Estimate results and the Full year results) into a new workbook, with a title of your choosing, removing links and pasting formulas as values. At the end of the 3rd year results, an automation button moves 2nd and 3rd year back and leaves the 3rd year empty for your next cash flow period. The 3rd year actual results become the new 3rd year budget and leaves the monthly actual period empty. This template is the ideal solution for everybody, for individuals, for trade and service based businesses, accountants and financial managers and is guaranteed to save users a lot of time when compiling cash flow statements. Assists users in developing an improved understanding of the calculations that need to be performed in order to compile a cash flow statement. Printer-friendly. Each worksheet is formatted to print on A4 Landscape paper for Fast Presentation and Decision Making. Auto Data Analysis : Automatically calculates Variance to Budget and Last Years Comparatives and Year-to-date Results. Cells can fit from one digit number Up to Eight Digits Numbers. i.e. from 1 Currency Unit up to 99.999.999 Currency Units. The same time includes three years monthly periods and ENDLESS! At the end of the 3rd year, moves back a year and leaves the 3rd year empty for your next cash flow period. Take your time and have fun learning how the different inputs affect your Cash flow statements and your Bank Balance at any given period of time during this 3 years period! Enter Information into light yellow shaded cells only! Enter the Monthly Cash flow you experience Monthly or Estimate the Remaining Months to see the Projected Cash flow for the year for each month. You enter information to the Budget sheets and to the Actual/Estimate sheets from Year 1 to Year 3 ONLY! ALL OTHER CELLS, SHEETS, CUMULATIVES, COMPARATIVES, STATISTICS and CHARTS are AUTOMATICALLY POPULATED. All worksheets are Automatically linked together so figures only need to be entered once! Amounts can be entered or copied from bank account or credit card account statements. The template includes 9 sources of income and 180 expenses within 20 categories. Reporting periods are determined based on a user defined start date and the reports can be rolled forward for any subsequent 36 month period by simply selecting a month from the spin button. You do not have a Cash flow Budget? Cash flow Budget? What’s a budget? If you’ve never had one before, start using one now. It’s the only way you can truly be in control of your finances. Do you forget to pay bills on time? This Cash flow Statement reminds you to pay your monthly bills before they are due. Do whatever you have to do so that you don’t pay unnecessary charges. No company is too big or too small for us -1 Month free trial !